The development of PIE is demonstrated in the images below. 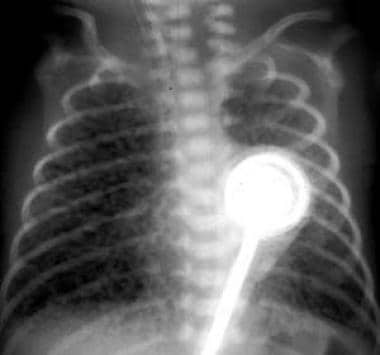 Anteroposterior examination of the chest at age 1 hour in this 27-week premature infant shows severe diffuse respiratory distress syndrome. At 7 hours, the lungs are overexpanded with multiple linear areas of lucency, indicating pulmonary interstitial emphysema. 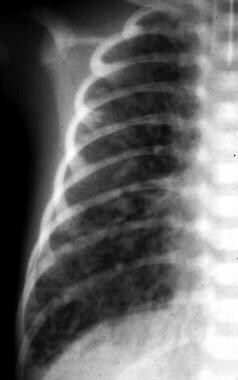 On radiography, PIE appears as linear, oval, and occasional spherical cystic air-containing spaces throughout the lung parenchyma. The interstitial changes are initially linear but may become more cystic as the air in the interstitium congregates locally. 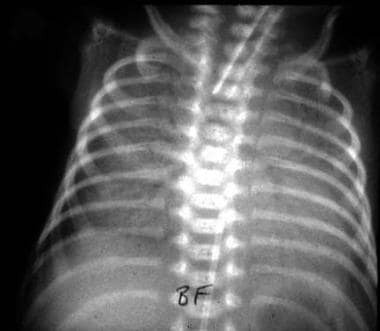 Subpleural cysts also develop and may rupture, producing a pneumothorax. The heart tends to get smaller as intrathoracic pressure increases; this results in diminished venous return into the chest. Overall lung volume is increased; however, the lungs are less compliant because they are splinted at a large volume by the air within the interstitium. Gas exchange is reduced by the increase in distance between the pulmonary vascular bed and the airspaces. Linear gas collections in the periphery of the lung, in association with an increased demand for respiratory support, are diagnostic of PIE. Increasing lung volumes also strongly support a diagnosis of PIE. Early bronchopulmonary dysplasia (BPD) may present as focal areas of hyperaeration secondary to partial bronchial obstruction. The pattern closely resembles PIE, although the lucency is less linear in BPD. At histopathology, many lungs of infants with BPD demonstrate PIE that was not seen radiographically. The images below demonstrate the radiographic characteristics of PIE. 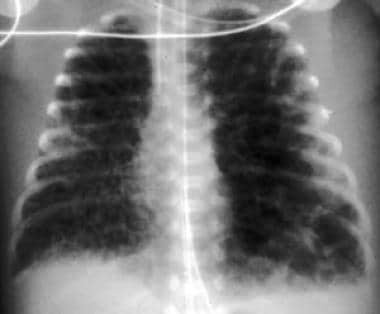 Pulmonary interstitial emphysema developing in an infant with respiratory distress syndrome at age 1 day. 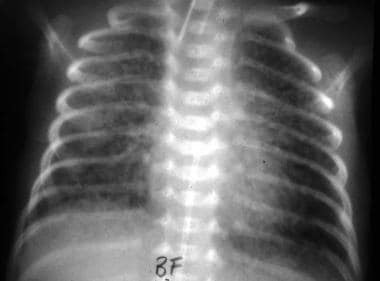 By age 2 days, the infant has not improved, and pulmonary interstitial emphysema is more extensive. Close-up examination shows the typical linear pattern of pulmonary interstitial emphysema. Shortly before death, despite efforts to decrease ventilatory pressures, the lungs remain hyper-aerated with diffuse pulmonary interstitial emphysema. Air in the lymphatics may rupture, causing pneumothorax, and can dissect into the peritoneum through potential openings in the diaphragm. 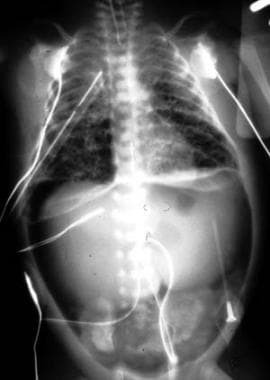 This infant has pulmonary interstitial emphysema, pneumothoraces, and pneumoperitoneum. What is pulmonary interstitial emphysema (PIE)? What is the role of radiography in the diagnosis of pulmonary interstitial emphysema (PIE)? Which radiographic findings are characteristic of pulmonary interstitial emphysema (PIE)? Gronbach J, Ehrhardt H, Zimmer KP, Waitz M. Early Pulmonary Interstitial Emphysema in Preterm Neonates-Respiratory Management and Case Report in Nonventilated Very Low Birth Weight Twins. AJP Rep. 2018 Apr. 8 (2):e99-e105. [Medline]. [Full Text]. 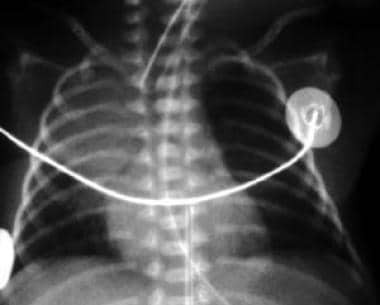 Nuñez-Ramiro A, Aguar M, Cernada M, Parra-Llorca A, Vento M. Oxygen needs during resuscitation and surfactant to achieve stabilisation were independent risks factors for pulmonary interstitial emphysema in preterm infants. Acta Paediatr. 2018 Jan. 107 (1):28-32. [Medline]. Cochran DP, Pilling DW, Shaw NJ. The relationship of pulmonary interstitial emphysema to subsequent type of chronic lung disease. Br J Radiol. 1994 Dec. 67(804):1155-7. [Medline]. Greenough A, Dimitriou G, Prendergast M, Milner AD. Synchronized mechanical ventilation for respiratory support in newborn infants. Cochrane Database Syst Rev. 2008 Jan 23. CD000456. [Medline]. Bawa P, Soontarapornchai K, Perenyi A, Goldfisher R, Amodio J. Development of Localized Pulmonary Interstitial Emphysema in a Late Preterm Infant without Mechanical Ventilation. Case Rep Pediatr. 2014. 2014:429797. [Medline]. Jabra AA, Fishman EK, Shehata BM. Localized persistent pulmonary interstitial emphysema: CT findings with radiographic-pathologic correlation. AJR Am J Roentgenol. 1997 Nov. 169(5):1381-4. [Medline]. Donnelly LF, Lucaya J, Ozelame V, Frush DP, Strouse PJ, Sumner TE, et al. CT findings and temporal course of persistent pulmonary interstitial emphysema in neonates: a multiinstitutional study. AJR Am J Roentgenol. 2003 Apr. 180 (4):1129-33. [Medline]. Chalak LF, Kaiser JR, Arrington RW. Resolution of pulmonary interstitial emphysema following selective left main stem intubation in a premature newborn: an old procedure revisited. Paediatr Anaesth. 2007 Feb. 17(2):183-6. [Medline]. Gaylord MS, Thieme RE, Woodall DL, Quissell BJ. Predicting mortality in low-birth-weight infants with pulmonary interstitial emphysema. Pediatrics. 1985 Aug. 76(2):219-24. [Medline]. Hart SM, McNair M, Gamsu HR, Price JF. Pulmonary interstitial emphysema in very low birthweight infants. Arch Dis Child. 1983 Aug. 58(8):612-5. [Medline]. [Full Text]. Heneghan MA, Sosulski R, Alarcon MB. Early pulmonary interstitial emphysema in the newborn: a grave prognostic sign. Clin Pediatr (Phila). 1987 Jul. 26(7):361-5. [Medline]. Morisot C, Kacet N, Bouchez MC, Rouland V, Dubos JP, Gremillet C, et al. Risk factors for fatal pulmonary interstitial emphysema in neonates. Eur J Pediatr. 1990 Apr. 149(7):493-5. [Medline]. Yu VY, Wong PY, Bajuk B, Szymonowicz W. Pulmonary interstitial emphysema in infants less than 1000 g at birth. Aust Paediatr J. 1986 Aug. 22(3):189-92. [Medline]. Barcia SM, Kukreja J, Jones KD. Pulmonary interstitial emphysema in adults: a clinicopathologic study of 53 lung explants. Am J Surg Pathol. 2014 Mar. 38 (3):339-45. [Medline]. Kim HR, Yoo SM, Lee HY, Han JH, Frazier AA, White CS. Presence of subpleural pulmonary interstitial emphysema as an indication of single or multiple alveolar ruptures on CT in patients with spontaneous pneumomediastinum. Acta Radiol. 2016 Dec. 57 (12):1483-1489. [Medline]. The cut section of the lung shows gas dissecting through the interstitium. Histologic section showing gas within the interstitium, mainly in lymphatic vessels. The pulmonary tissue is atelectatic. The surface of the lung in pulmonary interstitial emphysema shows subpleural lymphatics distended with air. Gas dissects into the interstitium from ruptured airspaces and is rapidly taken up by lymphatics in the interstitium.